Well, it’s Chocolate Week in the UK so it’s a happy coincidence that, at the last minute I decided to make a cake as an additional dessert for a BBQ with friends. As I still subscribe to (and read!) a lot of UK based food newsletters chocolate was featuring heavily and this simple fudge cake recipe from the UK’s version of Delicious magazine stood out as something I could put together in a very limited amount of time. I have to confess that part of the reason I was attracted to it was the use of red wine vinegar. There’s something about cake recipes with unusual ingredients that always makes me want to try them out! The cake hit all the spots … it was super quick to make and everyone liked it (I even packed up a doggy bag for a missing husband!) so it’s definitely one I’ll be making again. Begin by greasing and baselining a 20cm spring form tin and preheat the oven to 160°C fan (or 180°C). In your food processor (or mixing bowl) combine 100g unsalted butter, 15g cocoa powder, 300g self raising flour, 1 tsp bicarb soda, 225g caster sugar (use golden or unrefined if you can) and 2 eggs. If you’re mixing by hand or with an electric hand whisk you might want to sift the flour and bicarb first. The add 100g of melted dark chocolate (I am a new convert to melting chocolate in the microwave – but you do need to watch it very carefully!) and finish by mixing in 250mL of milk mixed with 1 tbsp of red wine vinegar. Pour the batter in to the cake tin and bake for 1 hour, until firm in the centre and a skewer comes out clean (with my oven I think next time I’ll check after 55 minutes). Cool in the tin for a few minutes and then turn out to cool on a rack. When the cake is cool, it’s time to make the ganache and finish the cake. For the ganache, melt 225g dark chocolate with 100g unsalted butter (be careful with the microwave – watch carefully and mix every minute or so to keep an eye on things – you don’t want the microwave coated in butter and chocolate!). Stir this mix until smooth and then add in about 150mL of thick (not thickened) cream. As this is an English recipe it specifies a 142mL carton of double cream so I just guessed approximately 150mL from my 200mL carton of pure cream. 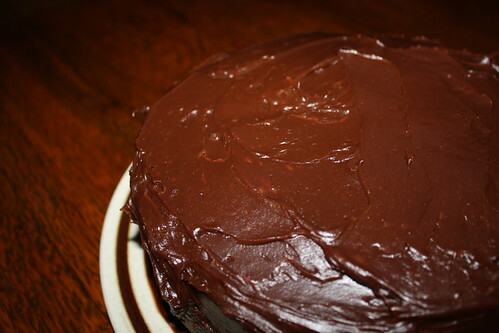 Allow the ganache to cool to a good, spreadable consistency and then slice the cake in half. Use approximately a quarter of the ganache for filling and then use the remainder as icing. Make sure you resist ‘tidying up’ the ganache until you’ve finished with the cake! The cake kept well for about 2 days … by that time it was all eaten (mostly served with cream!). Hi Alex – just came across your blog. It’s great to find an Adelaide based blog with reviews on so many local restaurants – very handy. I’ll be visiting regularly. Great looking cake – always love a simple, quick and impressive looking cake to add to my repertoire.